Okay, I know it's been a really long time since I posted. Lots has been going on in my life. 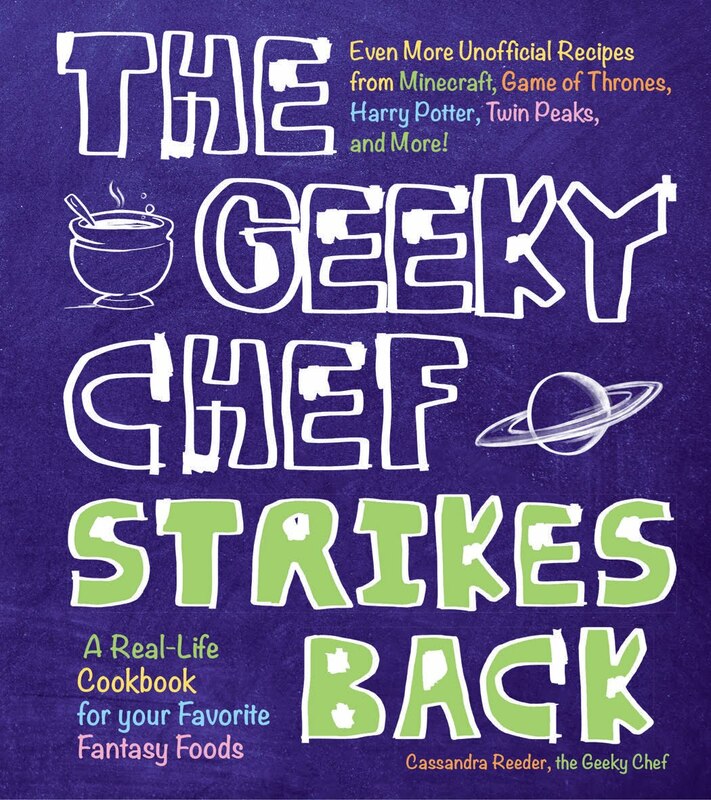 I got married, I moved to another state, I wrote a super awesome cookbook that you should buy right now... And sometimes I'm just too busy with the Geeky to focus on the Chef. Lately, Dragon Age: Inquisition has been how I spend my down time. The game doesn't have a whole lot of food going on, but it's fun and well-written and just plain spectacular, so I forgive it. This idea comes from a special dialogue option with Iron Bull, which you may or may not come across depending on how you've played the game. 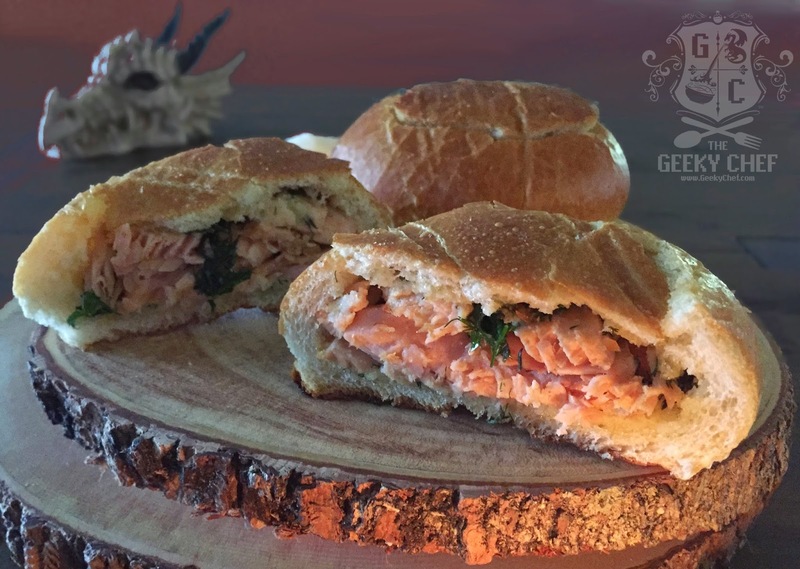 When asked about Seheron natives, Iron Bull mentions a street food sold by a fisherman in Seheron, which he describes as fish inside of thin bread. In the tale the fisherman had been forced to poison Iron Bull's sandwich but we're going to go ahead and skip the poison. I also considered doing a recipe for Inquisition Cookies, which those of you who are close with Sera may recognize, but I thought these sounded a little more interesting. Have you guys come across any other intriguing foods in Inquisition? Let a girlfriend know. Combine garlic, herbs and zest with the softened butter and set aside. Season the Salmon with salt and pepper then pan fry it on medium-high heat on both sides or until browned but not burnt, about 4 minutes each side. Let rest. Using a sharp knife, cut a circle from the tops of the bread rolls, set the piece aside. Remove the interior bread from the middle of the roll to make room for the salmon, but do not tear bottom or sides of the roll. Set aside the removed bread crumbs to be used int he next step. Repeat step for each roll. Cut the salmon into 1-inch pieces and combine with the bread crumbs. Take about a 1/2 cup of the herb butter and spread on the insides of the each of the rolls evenly. Stuff each roll with Salmon/bread mixture. Spread the remaining herb butter on top of the salmon and on the bottom of the bread caps, then replace the bread caps on the rolls. Bake the rolls on a rack at 350 degrees for about ten minutes, or just enough time for the herb butter to melt all up in the insides and the bread to get crispy on the outside. I remember this conversation with Bull. I was imagining the fish wrapped in a tortilla but this sounds so much better! Thank you! I actually did consider going that route, but this way is super tasty. I'm glad to see you back! I'll receive the cookbook in a few weeks, it looks awesome. And congratulations for your wedding! My best wishes to you and your family. Thank you so much, Inny, you have truly made my day. 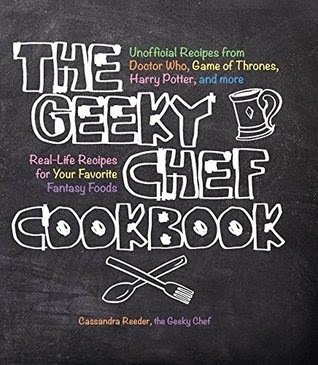 I hope you love the cookbook!